Silent Running... or Am I Going to Damage The Engine? By now, everyone knows that the Tomei Powered EXPREME titanium exhaust which I fitted to my car (after having served as the jig during the design of the EXPREME exhaust) is loud. In fact, for use in Japan, the exhaust is labelled as for off-road use only. Clearly it does not have the JASMA sticker which would indicate it passes certain criteria to be considered "street legal." In any case, the loudness does me no favors - if I want to leave my house early, or come home late, it wakes up the neighbors. Of course I use the Tomei supplied bung, but it still doesn't really quiet it to the level of a regular road car. And of course, the bung defeats the purpose of a race exhaust, as it means I run around with a half blocked exhaust. Of course I'd run the car without the bung, and the response is noticeably improved. It makes the connection between right foot and engine, extremely direct. So basically, I got tired of the compromise known as the "exhaust bung"
However, not only is there no cool factor, but the prospect of having to drill a hole somewhere, plus the need to always think about whether the valve was fully open or closed, was too much for me. I needed something automatic. 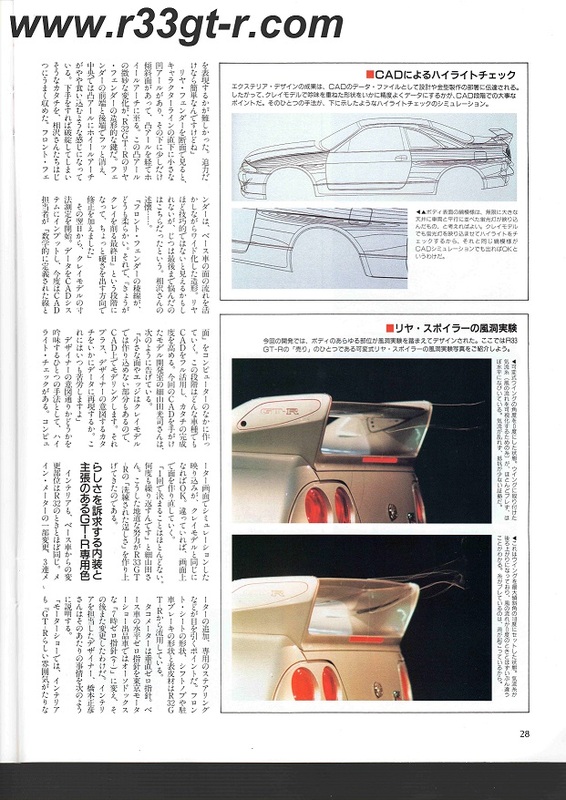 And then I saw an article in GT-R magazine for a product that appeared to be designed for the R35 - the Blitz E-ESC. Normally I might do the install myself, but I figured the scraped knuckles, and time away from family was not worth it. So off to Be Ambitious, where Ninomiya-san did his usual great job. I also consulted him for some other work, which will likely end up done and thus posted to this blog. Ninomiya-san, however, warned me that he thought that this device had the potential to damage the engine, due to back pressure caused by the valve in its closed position. Further he explained, basically there was no difference in exhaust sound, from about 20% to 100%. Which meant that any value to this device, would be from 0% to 15%. He felt that running around with the valve in this position, would cause premature wear on the engine, with the increased back pressure. There would be no advance warning either. So he set up the device so that it would fully open at 1200 rpm. Granted, my idle is about 900-1000 rpm, so this device is closed at 0% only when I am idling, at a stop light. As soon as I step on the gas, the valve opens up to 100%. I don't have a sound clip yet, but from driving the car home tonight, yes the car is ridiculously quiet at red lights. In fact so quiet if I didn't hear the engine noise I would wonder if the car was on. I played with the unit a bit, and while 0% is extremely quiet, at 15%, even 20%, the car is quieter than before with the bung inserted. So if 0% puts a stress on the engine, maybe 15-20% is the way to go? The irony, of course, is that in parking the car, I have to step on the accelerator to get the car to back into my garage. This raises the RPMs to above 1200, which results in the full roar of the exhaust. My wife confirmed that, from inside the house, she did not notice any difference as compared to before. Let me know your thoughts, please! Back from Mine's... Fixed and Improved! So yesterday morning I went down and retrieved my car from Mine's. whose car suffered the same problem, at about the same time! I was told this is one of two hoses used to cool the OEM oil-water heat exchanger, located in back above the starter motor, and below the fuel rail and assorted wiring. Nakayama-san replaced both for good measure. 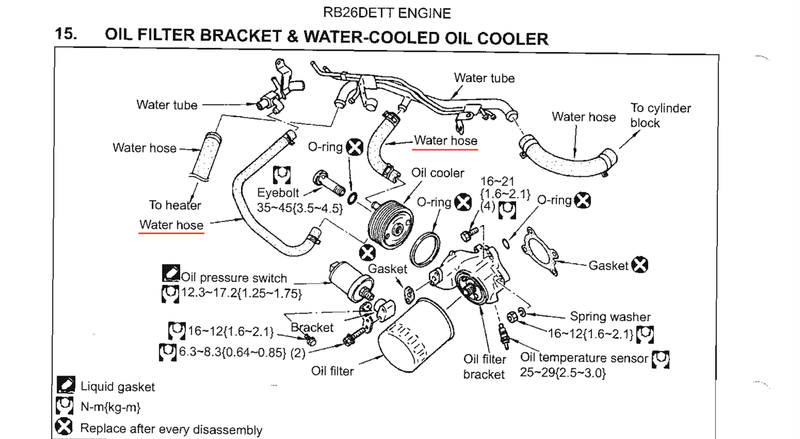 In this excerpt from the repair manual, you can see how those two hoses connect to the oil cooler. however if someone has a better photo and verification, I would be most grateful! To replace these hoses, they chose to remove the transmission to access the back of the engine. They then flushed the coolant system, and checked for leaks. So now there shouldn't be any more problems going forward... at least not with these hoses. Thus, the engine did not have to be removed, which means I was not tempted to open the wallet and install those optional goodies I was hinting at. Perhaps next time! Although, from my research on this, I am now not sure why this piece is still there. That is, on a road only car, this oil cooler mechanism is obviously enough to keep the oil temperatures in check; but you need an external one if you run your car on a track, however once you install that optional external oil cooler, not sure why this needs to remain. In fact wouldn't it work backwards and heat up the coolant? Someone said that this could be to warm up the oil as the coolant warms up faster, but that doesn't really make sense as oil should be designed to lubricate at even colder temps. So I wonder if this should be removed in the future (one less thing to go wrong), or kept as a back up just in case? And, I wonder if these 4 hoses (shown in the diagram) are available in silicon? In any case, Nakayama-san inspected the engine and confirmed that the engine suffered no problems from the incident. So that is a relief. As for the catalytic converter, they weren't kidding when they told me it was "dead." Check this out! Other side... when I held this up to the light, could barely see ANY light coming through! So I suspect that this degraded and clogged up catalytic converter was doing me no favors. I asked why OEM catalytic converters last for the life of the car, while this one only lasted for about 8 years. The answer is, of course, the more free flow nature of these aftermarket ones, plus the additional power of the tuned up engine. In any case, I've now got the HKS catalyzer installed, and the first thing I noticed wasn't just that everything smelled nicer (or more precisely, no smell at all...) but that the engine seemed more eager and responsive. If I recall correctly, this is how the engine was back when I had it installed - very revvy, like a motorcycle engine, and extremely responsive (the engine was put in about one year after the Apexi catalyzer was installed so presumably it was still working well then). Boost comes on much quicker and the turbos make that funny whooshing sound much more clearly and frequently now. And this is still with the bung installed on the Tomei exhaust...I'm now tempted to run the car without the bung and with a de-cat, just to unleash its full potential! In any case, this incident has been a wake up call, so I think I will be having more work done on the car very soon. Stay tuned! So got an update from Mine's earlier today. Turns out, the problem was not one burst hose but two! Not sure exactly which hoses (they were behind the engine), but likely due to normal wear and tear? Or is something else to blame? I'll find out when I pick up the car hopefully later this week. I had also mentioned when I dropped the car off, to Nakayama-san, that my car's exhaust stunk. In fact it was overpoweringly bad. Mine's is reporting that this is because the catalytic converter (Apex'i Super Catalyzer) is dead. I suspected this, in fact, and was thinking about getting another one to replace it. The Apex'i replaced the OEM one that was on the car when I bought it. This was a couple of years even before I had the Mine's engine put it, circa early 2006. 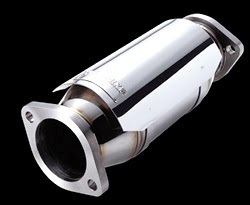 At the time, in my research I found that the Apex'i was the best catalytic converter because it had the lowest cell per square inch (cpsi) of only 130 cpsi - most other catalytic converters were in the 200 range (OEM is 400) and therefore more constrictive. However, I always believed that catalytic converters pretty much lasted the entire life of the car, although now I suspect that is only true if your car is not highly tuned. But a relief the smell wasn't necessarily caused by the engine. I've asked Mine's to go ahead and install a new catalytic converter - they've recommended an R33 GT-R specific one by HKS, which happens to be the one I was looking at anyway. Hopefully they will have photos of the old one for me to see how badly it had degraded. 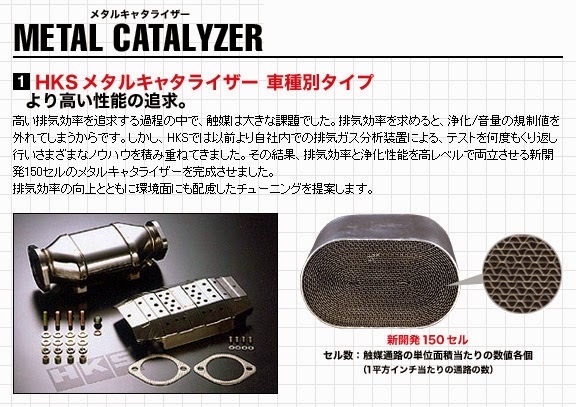 The HKS one has 150 psi so a slight increase, however their website claims that their catalyzers have "high purification performance" - so something to look forward to, if true. And if for some reason the HKS fails or dies in the future, at least its replacement cost is not as much as the Apex'i. In any case, as Mine's has the car for a few more days, I've decided to ask them to do a full check of the car, in order to see if there are any other parts that could be suspect. I'll post what (if anything) they find. Hopefully this whole incident was just a wake up call for me to pay more attention to my car! Since I haven't heard anything from Mine's since my last post, I've been trying to clean up parts of this blog. For example, I updated my Spec List page and realized that I had made some mods, and even took photos, but had forgotten to post when I did those mods! So, time to post and get those photos up. First up - aluminum pedals. This I did back in April, 2010! To be honest, I was hesitant to do this mod. Second, aluminum isn't going to be very useful if the soles of my shoes are wet from rain. Then, I realized that since I almost never drive in the rain, this should not be an issue. Out of excuses, I went ahead and ordered a set from Nissan. Note in the photo below there are three "bush" - but if I recall correctly, only two were actually needed (I can't recall where I got the part number list. Unfortunately, I also don't remember which one bush I didn't use, but as they are cheap parts, I would go ahead and order all 3 if you are going to do this mod, unless you have access to a proper parts list). No instructions were included, but this can't be that hard. The foot rest was a simple bolt off and bolt on affair. Next up was the gas pedal. Note the difficult part here was, getting that clip undone that holds the top part of the pedal. A small standard screwdriver is handy here. The aluminum pedal - I can't recall exactly, but I seem to remember that you had to be careful to force the bottom piece (onto which the metal pedal arm hooks into) in. The top piece is self explanatory. I don't know what that piece on the right is?? I think it wasn't needed. Turned out that the brake and clutch pedal were the most difficult to get on. I ended up using a hair dryer to soften up the rubber, and then quickly stretch the rubber part on the back side of the pedal around the metal pedal arm portions. Here is the aluminum pedal installed, from the back. Looks good! Yes, I lost the "R" factor, as these same pedals are now found throughout various Nissan vehicles. Still, I can't complain as they look good and I GUESS the small rubber sections on the left and right of the brake and clutch pedals act as anti-slip mechanisms for wet shoes. Also, yes I have seen Nismo branded aluminum pedals, but was never sure if they were fake or not. So I stayed away from those, even though I'm pretty sure Nismo did at one time have such parts available. 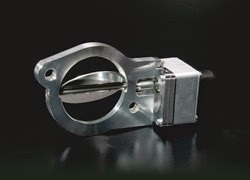 In any case, this was one more small thing I did to help "modernize" the car - heck if Nissan installed these on the later model BNR34s, then of course they would have put these on the R33 GT-R had these parts been available back then, right? So I finally got a call from Mine's Takayanagi-san to update me on my car. Apparently, they found most of the water in the cooling system, gone! So they suspect a broken hose somewhere. No visible damage anywhere, so likely they will have to lift up the car and/or remove the engine to be sure. If the leak was from a hose somewhere, it would have happened very rapidly, as I don't recall seeing a puddle of coolant in my garage area. So it would have happened that day when I drove to Yokosuka. Additionally, they found that the water that remained, was rusty. This is probably my fault, I can't recall the last time I had the coolant changed - I thought it was a couple of years ago - and I've never had any cooling issues. Takayanagi-san doesn't believe I need a new radiator, but it (and the whole system) will simply need to be flushed out thoroughly. In any case, I will let them first diagnose exactly where the leak is coming from, but assuming that it is a hose that gave way, I think I will have to replace some of those hoses back there with something stronger. Steel braided looks nice, but my understanding is that silicon hoses are just as strong and reliable (so long as you use the proper clamps) and steel braided's drawback is that the braiding prevent you from finding the source of a leak quickly. People's thoughts on this? If I do silicon, what color? Blue or black? (note I already have the Samco set for the radiator, in blue). So this past Sunday afternoon, I was driving around Yokosuka (where the US Naval Base is), when all of a sudden I heard something weird: like a fluid hitting something hot, repeatedly. It sounded like this: "pshh pshh pshh pshh." I first thought something had gotten caught in one of the brake calipers, but then I began to see some white smoke. Still the optimist, I kept going, and headed onto the expressway. However, entering a toll booth, it just seemed like there was a BIT too much smoke. Also, the idle speed was too high - like at about 2000 rpms. Did not sound normal at all. So I finally pulled over, popped the hood, and tried to locate the source of the smoke. It seemed to be coming from the back of the engine area, on the side opposite of the turbos, down near or on the firewall. And of course everything was too hot back there to touch, and further, it was getting dark... quickly. In any case, having spent a good amount of money on the engine, I wasn't going to press on and risk damage. 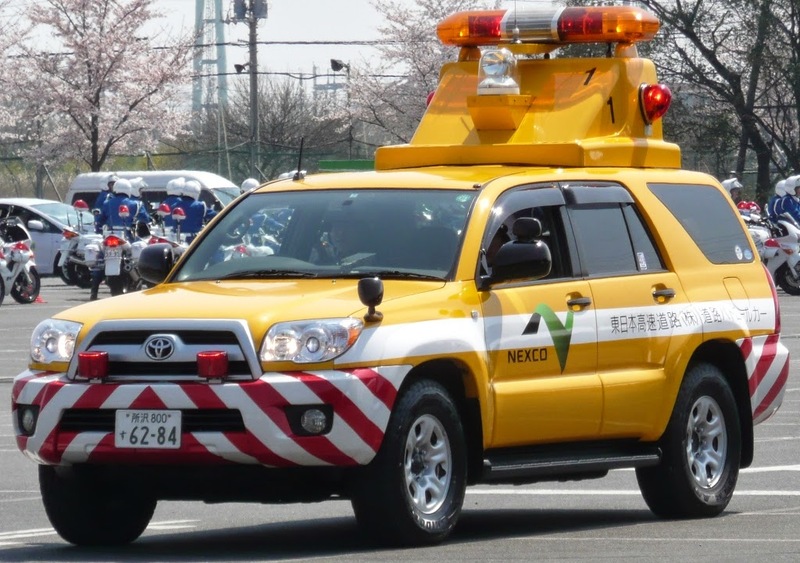 So I called roadside service (JAF - Japan Automobile Federation) and they dispatched a flatbed to pick me up. JAF is great - only 3000 yen per year, and they offer numerous services. When they tow or haul/flatbed your car, they do so anywhere within 15km for free! In any case, the operator (who didn't know much about cars) was going to send over the first available tow truck... but then this flatbed showed up. The JAF driver told me, as soon as they heard "Skyline GT-R" over the radio all the local drivers knew it had to be a flatbed. So this driver who was nearby volunteered to come over. It turns out that there are two types of flatbed - the ones that extend the entire platform to the ground, and those that slant. Obviously, your car has to be drivable to use the slant one (they can winch it up, but because my car is so low, that would be tricky). commented on how good the car sounded, asking me "hey is this a Nismo tuned engine?" When I told him it was a Mine's engine, he got excited and asked me more questions, even though I was busy at the time listening to the JAF driver as he directed me to drive up the ramp slowly, one meter at a time as he used wooden blocks to make sure my car's front lip spoiler didn't scrape! Sheesh. Interestingly, he told me that customers with RB26 GT-Rs were keeping Mine's busier than R35 GT-R owners... that plus those overseas trips he has been taking leaves him tired! Takayanagi-san pulls my car into the garage of one of the world's most awesome GT-R shops. 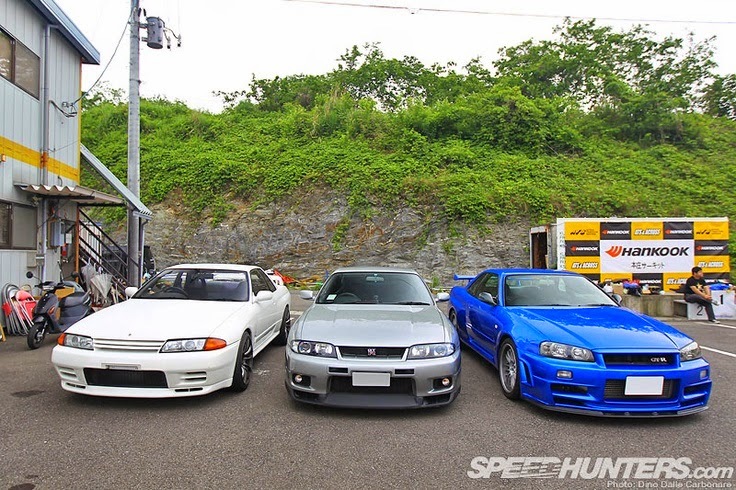 On the left, the Mine's R34 GT-R. On the right, a Stagea RS260! 3 world class RBs lined up? Once again, the car sounded great upon unloading. Nakayama-san DID agree with me that the exhaust smelled worse than it should (a long standing problem which I've been neglecting a while) so he promised to do a thorough whole car inspection for me. So now, all I have to do is wait to find out what they diagnose is the problem with my car. Going back to the beginning of this blog, Mine's did the new engine install back in late summer of 2007, so it's been just about 7 years. During that time, I've had a leaking water line, and then a few months later, had the turbo oil lines break, (twice!) spewing hot oil all over the place - the smoke this time was not black, was coming from the other side/rear of the engine, and there was no oil residue so I'm optimistic that it doesn't involve these oil lines. This time, I'm hoping that it's nothing serious, in which case, I will ask that expendable items in the engine bay be upgraded to the extent possible. IF the engine has to come out, however, then maybe it's time for a few "optional extras" to be installed?? Any suggestions? 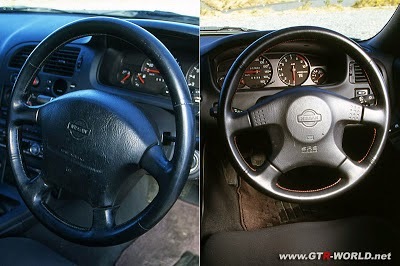 Continuing from the previous post - (How the R33 GT-R Improved Upon the R32 GT-R (Part 1 - Aerodynamics and the High Traction Layout), the following items seem more mundane and evolutionary, versus revolutionary. Also, these are areas that have been widely discussed in the English press and so the big improvements may not be new to you - however, I still discovered items of interest, as described below. Not surprisingly, the video describes or mentions, in addition to the items in this post, most of the items I wrote about, not just in the previous post but also much of what appeared in the design trivia posts (Part 1, Part 2, Part 3). Basically the same, except boost was raised in response to Nissan test drivers who wanted more torque and response. This resulted in 1.5 kgm more torque (to 37.5kgm) and more horsepower, although due to the gentleman’s agreement, power continued to be listed as “280ps.” Engine management (and thus response) was improved as the engine ECU was changed from 8 bits to 16 bits for more detailed engine control, response and reliability. With the BNR32, in addition to high speed corners being tricky as the car generated lots of understeer, there were also times where traction was not satisfactory. So the goal with the BCNR33 was to have it behave exactly as you wanted it to. Yes, everyone knows by now that the R33 V-Spec model came with the electronically controlled Active LSD, while the standard BCNR33 did not. 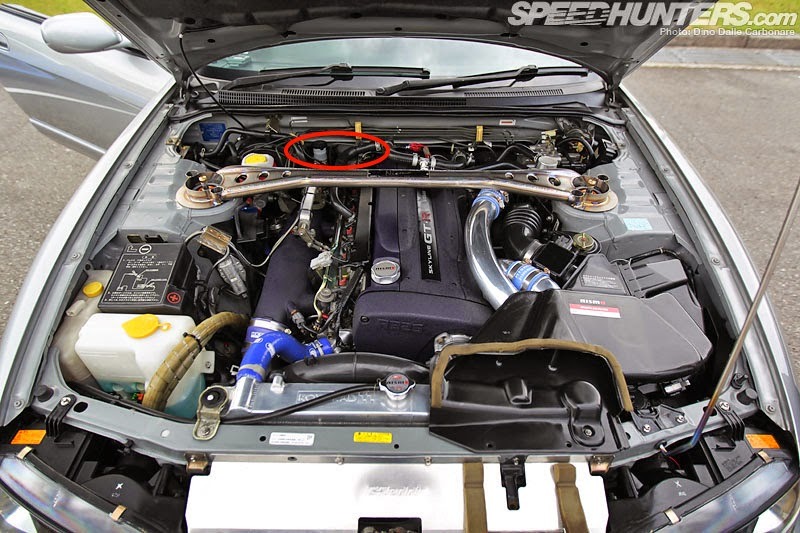 This leads many to believe that the standard R33 GT-R uses the same ATTESA system as the R32 GT-R… which is true for the hardware, but NOT the software. Hiroki Sasaki, in charge of ATTESA-ETS in Nissan’s Chassis department, explains that the problem with the R32 was that it understeered badly, it simply would not turn. They researched the issues, and ended up changing (the software on) how the torque split is done. As a result, the R33's handling is more precise. The R33's ATTESA ECU is able to take into account more road and speed conditions, using higher capacity (higher limits) sensors, to better tune the car's response in light of the driving conditions and compatibility with the tires. 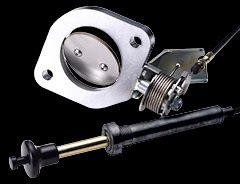 For the ETS-PRO, they initially borrowed the Active LSD that was already being used in the standard (2wd) R33 in a quest to maximize real wheel traction. However, initial testing did not go well, so the engineers spent a lot of time experimenting. They finally got it to work well, but this also was due to improving body rigidity and tire performance, finally better. Here are a few photos of the active rear diff - note that it has the finned cover, which the standard differential does not. 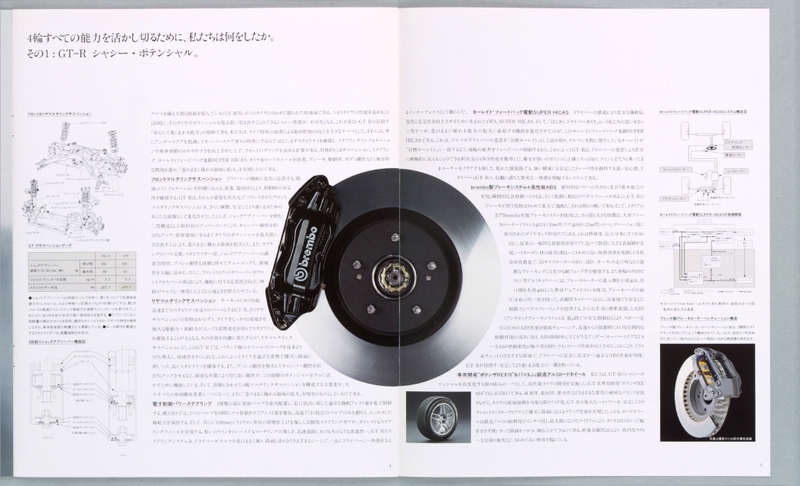 Brakes: all cars, both V-Spec and Standard trim, came with the Brembo brakes that made their debut on the R32 GT-R V-Spec models. 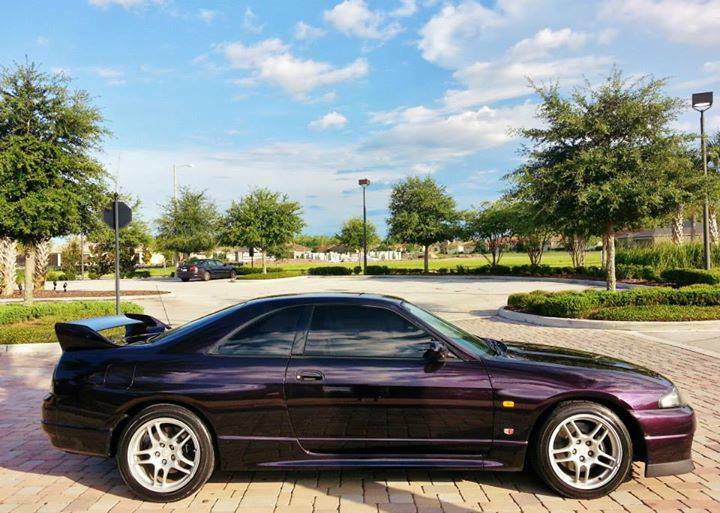 I occasionally hear about the odd R33 GT-R that doesn't have Brembos on it... unfortunately, those were stripped of the Brembos before being sold to the unsuspecting new owner. 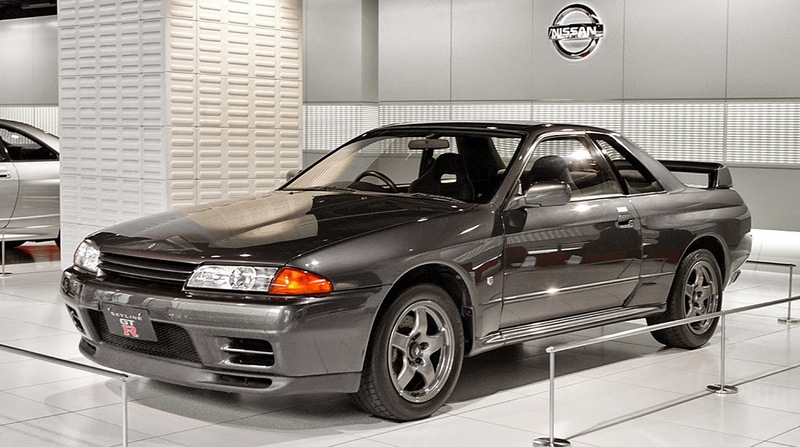 Super HICAS: The R33 adopted the electrically driven Super HICAS versus the R32’s more primitive Super HICAS which was hydraulically driven, heavier, not as precise and did not utilize a yaw sensor. See my technical note about this from an earlier post. HICAS appears to be a touchy subject - many people claim that "HICAS kicked in" to explain why they lost control of their GT-R. I believe this is the result of people not understanding how HICAS works, and not understanding what else could cause handling issues - HICAS is an easy culprit to blame, especially given the number of hydraulic HICAS equipped R32s, the fact that many tuners sell lock out bars, and the apparent complexity of the mechanism itself. I'm doing research on this issue, and I hope to be doing a future post on this topic, soon. Putting it All Together: Along with a more responsive intercooler, all of the changes mentioned above and from the previous post resulted in a car that Nissan engineers claimed was more responsive and faster than the R32 GT-R, as demonstrated by the significantly faster performance at Nurburgring (in Japan, the advertising copy was “Romance of minus 21 seconds”). By the way - here is Nissan's official profile (in English) of Kato-san: Nissan Legends - The Man Who Found His Calling -Hiroyoshi Kato. Next - time for some mods for my car (finally)! So although I've previously explored the differences between the R33 and R34 GT-Rs, and discovered that while the running gear basically stayed the same, with improvements to body rigidity and aerodynamics (as well as styling, of course) being the main differences, I hadn't yet really looked into the differences and improvements between the R32 and the R33 GT-Rs. 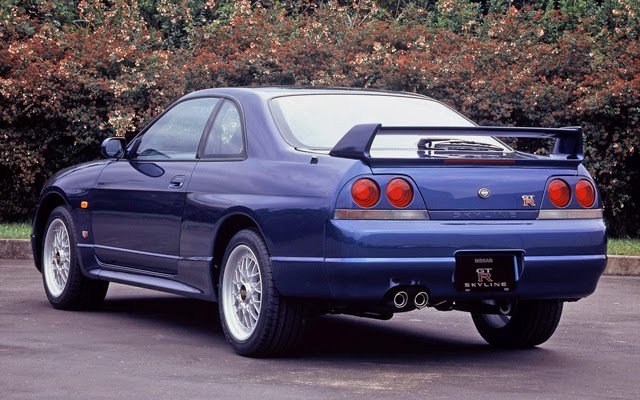 Nissan had a problem - the R32 GT-R was spectacularly successful - and its successor the R33 was bound to be in its shadow unless it was substantially better both subjectively and objectively. 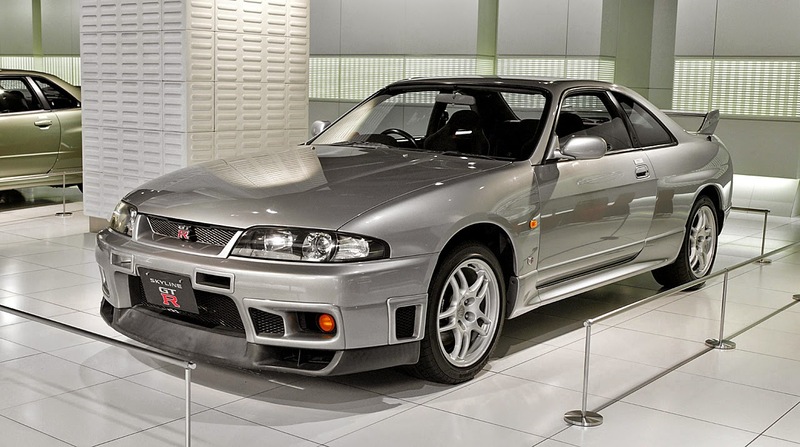 While R33 haters may not like to admit it, the R33 GT-R is a technically much improved car over the R32 GT-R - so much so, if you recall the objective when designing the R34 GT-R, Nissan's goals were not to make it any faster than the R33 (it was deemed fast enough), but rather, just easier to drive for the average driver. In any case, with all the information I found, I've split the discussion into two parts - this post, Part 1, which examines the improvements in the exterior (design and aerodynamics) and the "High Traction Layout" (balance and body rigidity), and the next post, Part 2, which examines the Engine, ATTESA ETS PRO, and Super HICAS. 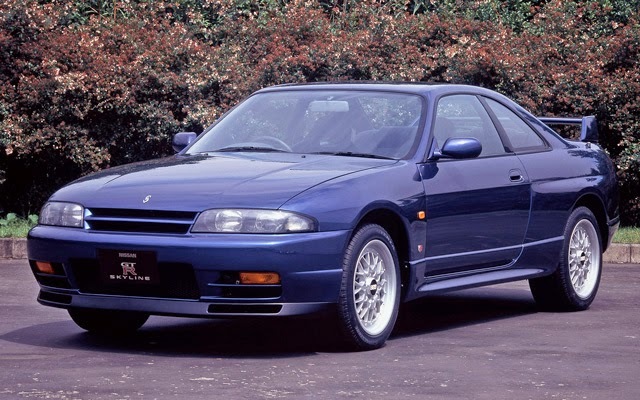 When development of the R33 (the general model, NOT the GT-R) began, it was initially conceived that the 2 door coupe would ride on a shorter wheelbase than the 4 door sedan. The coupe was to have a shorter hood as well (further, no turbo model was contemplated). This all changed, however, when Nissan decided to put the coupe on the same wheelbase as the sedan. 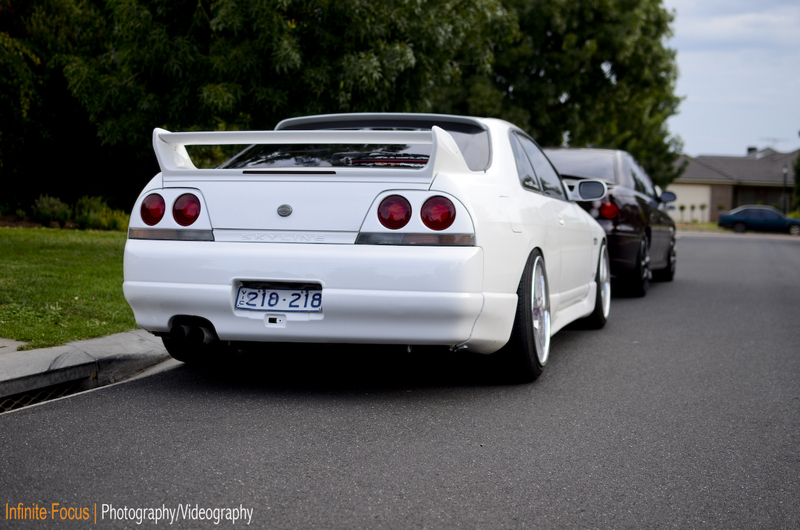 We all know that the R32 GT-R excelled in the Group A racing series in Japan. However, the R33 GT-R was facing a different race series (N1 Taikyu), this one which required sustained speeds exceeding 250kph; this requires not just awesome acceleration but stable braking prowess as well. Thus, Nissan decided to put heavy emphasis on aerodynamics during the design; and not just better aerodynamics, but balanced aerodynamics. 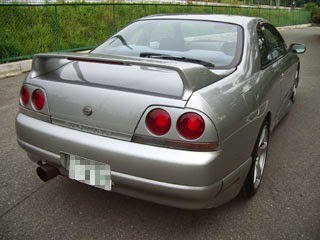 The R32 was developed with the “Zero Lift” concept in mind, hence it sported a large rear spoiler to help keep the car on the ground and provide stability in high speed cornering. However, its coefficient of drag was 0.40, which was not something to brag about even back then. Further, based on racing experience Nissan wanted the R33 GT-R to have superlative cooling and anti heat abilities, which would require large openings for the radiator and oil cooler. The front spoiler would have to be a shape which would reduce front lift as well. Nissan called the design theme for the R33 GT-R, "Sophisticated Strength" - while engineers wanted superior aerodynamics, cooling ability, and a wider tread, the designers wanted a design that suggested speed and power. "The R32 had excessive front lift. At Fuji Speedway, taking the high speed 130R corner at speed was scary, according to Kaz Mizuno (later father of the R35 GT-R). So efforts were made in the R33 to minimize front lift - and in that regard, the longer front overhang worked in our favor." 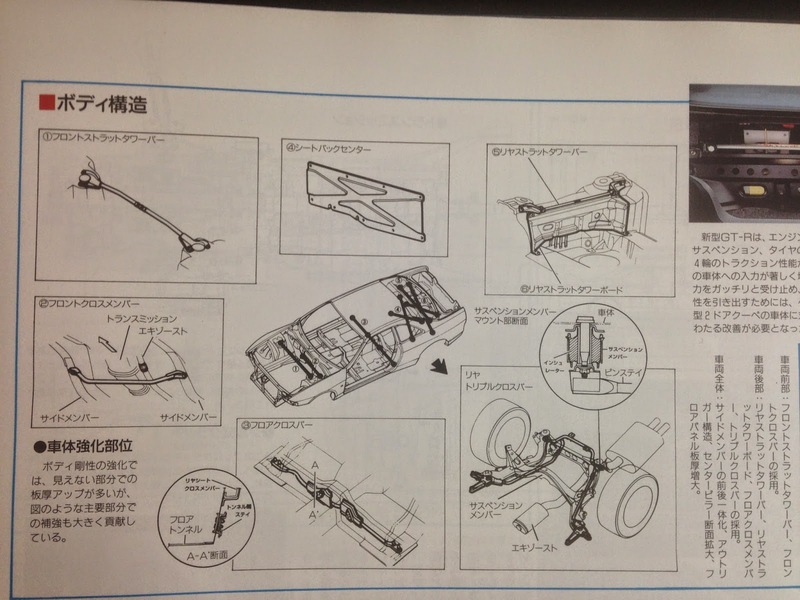 The R33 GT-R Proto - I'm not sure I see the narrower lower belt line? Initially this rear trunk spoiler was a fixed position one, but at the very last minute a decision was made to go with the adjustable one we have now. 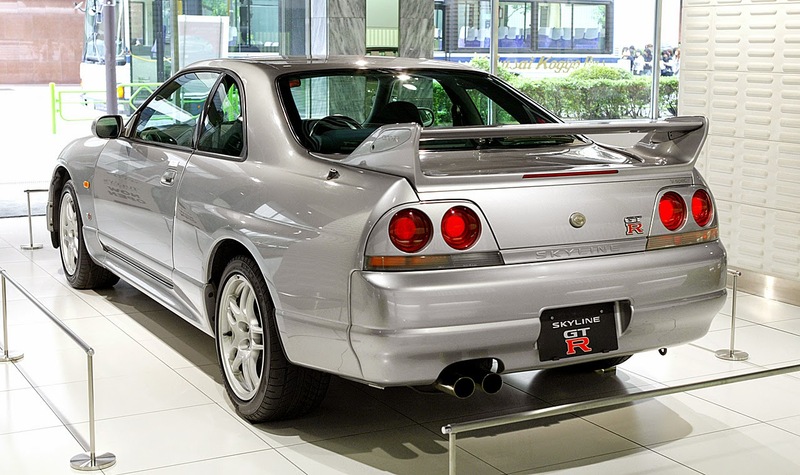 Incidentally, the original fixed spoiler design can now be found on the R33 GTS25t Type M.
The R33 GT-R could have had this rear spoiler design. Also, one aero design that was considered at the time, was to have a roof spoiler in addition to the rear trunk spoiler. GT-R could have looked like this, with the roof spoiler! There was extensive wind tunnel and road testing of the design, with efforts made to obtain the best front-back lift balance while allowing for wide tires, blister fenders and rear spoiler. In the end the Cd equaled 0.35 (beating the R32's 0.40), and the front /rear downforce was better balanced, with a front coefficient of lift of 0.09, and a rear downforce of 0.03 (with the spoiler at the flat position). Even with the bigger body. In addition to the aerodynamics, the High Traction Layout improved the dynamic performance of the chassis. This is Nissan's terminology for the technical chassis design differences which were designed to improve the performance of the R33 GT-R over the R32. In addition to the improved aerodynamics, the High Traction Layout improved the dynamic performance of the chassis. It did this by improvements in two areas: body rigidity and weight distribution. With the addition of front and rear strut tower bars, as well as adding cross bars under the floor in over 30 locations, rigidity was improved – 40% increase compared to the R33 GTS, and over 150% (1.5 times) more rigid than the R32. The improvements include, front tower bar, front cross bar (which connects the sides of the transmission tunnel), floor cross bar, the seat back center (the plate behind the rear seats), rear strut bar, etc. From: "All About the New Skyline GT-R"
Four wheel multi-link suspension: The front layout was changed. The R32’s weak point was the use of an “I” shaped upper arm, which was susceptible to rattles. These were changed to “A” arms, which gave 90% more lateral rigidity. In the rear, Nissan added the “triple cross bar” – which adds more rigidity for the suspension members (in the R34, it also provided a nice place to hang the rear carbon diffuser off of… the 33 and 34 triple cross bar is the same, incidentally). Having increased body rigidity means, of course, that power not only gets to the ground more directly, but the suspension behaves more accurately. To the driver, this makes the car feel more nimble and agile, with more direct feel, and thus easier to drive. The Problem: The R32 GT-R was criticized as being too front heavy, which lead to strong understeer. Additionally, the fuel tank was placed below the trunk floor, meaning that there was weight overhang in the rear as well. Not only was the weight BEHIND the rear wheels an issue, but as fuel was consumed and the rear got lighter, there was an obvious effect on the car’s performance. Combined with a less rigid body, the R32's potential was wasted. The Solution: With the increased wheelbase, it was now possible to improve weight distribution; the plastic fuel tank was placed below the rear seats, battery moved to the trunk, and to the extent possible, heavy things were moved towards the center of the car. The front and rear overhang weights were lightened. But improving the weight distribution wasn't just about moving things around between the wheels - it also means reducing weight in critical areas to improve the balance of the car. The increased body rigidity didn't help - the added bracing added to the car's weight, which meant that Nissan engineers had two compelling reasons to try to figure out ways to lighten the car. Up front, to reduce front overhang weight, the front hood and fenders were made of aluminum (as in the BNR32), the headlights were made of lightweight plastic and the intercooler was lightened, in order to lighten the front overhang, reducing inertia. The intercoolers were changed from extruded multi hole tube to inner fin type which improved response, cooled 4% better, and was 400g lighter. Nissan engineers also found other ways to reduce weight, even by a few grams. Hollowing out the side door beams. Using high tensile steel on body panels. Reduction in sound deadening materials. Hollowing out of rear stabilizer bar. 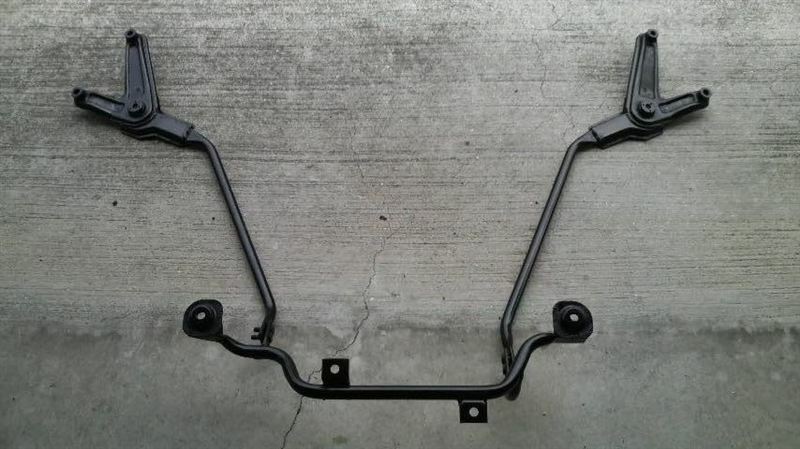 Use of high tensile springs front and rear. New plastics were used for : fuel tank, head lamps, super high strength "PP" bumpers, air cleaner, changing the headlining material, changing material of rear spoiler. So even though the R33 was heavier by 100kg, the records show that it was 30kg heavier up front, and 70 kg heavier in the rear. 1) With the battery moved to the back, as well as the rear strut bar, trunk space and volume is smaller on the R33 vs the R32. 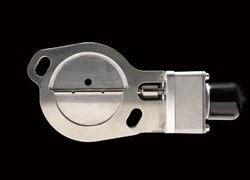 2) Additionally, the fuel tank shrank from 72 liters to 65 liters… resulting in a lower range. In any case, I think they did a great job on both the looks, aero and chassis development. It is ironic that people criticize the longer wheelbase without understanding how Nissan engineers actually used that to the car's advantage from a dynamic technical standpoint - the longer wheel base is not just stability at speed in a straight line, but also with the High Traction Layout in corners too! It's common knowledge that BBS Japan made the forged aluminum alloy wheels for R32, R33 and R34 GT-Rs. 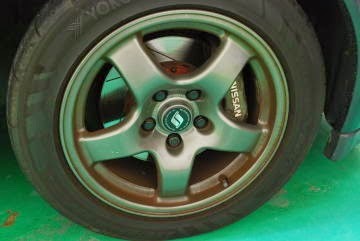 What is not as well known is that, in fact, the R33 GT-R wheels were based on the look of the R32 wheels – instead of 5 solid spokes, there are 5 hollowed out spokes (so they appear to be 10 spokes). In the beginning, there were two candidates for wheels – a refined/evolved version of the R32, or a new 5 spoke design. 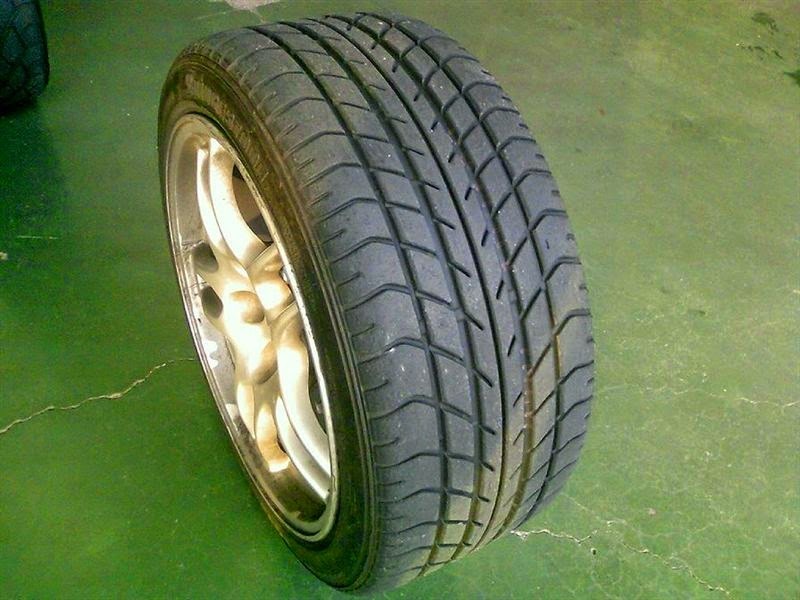 They wanted to go with the first design, but quickly realized that in a 17 inch rim size, the wheel got heavier, which is how they came up with the 2 rib per spoke design. At the time, the 2 rib wheels were rare, so appropriate for the GT-R. The wheels were also designed to improve the cooling characteristic of the wheel, so that owners could go to the track using the OEM wheels. There was also a candidate design of 5 flat spokes (like the Ferraris back then), but the dished look won out, to give a sense of fullness and strength. The R32 wheels, by the way, were inspired by F1 wheels, and their design was done so that the calipers would be visible from above. Same theme with the R33. 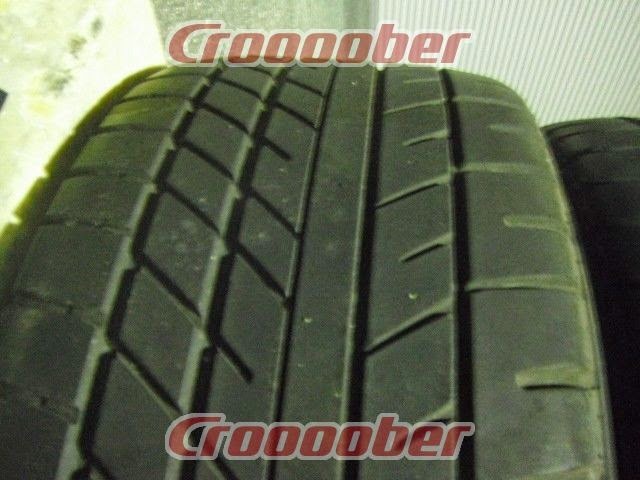 So what is the difference between the Bridgestone Expedia S-07 tires that came on the V-Spec, vs the Bridgestone RE010s that came on the standard BCNR33? Both were specifically designed for the GT-R, and we would expect to be the S-07 to be higher performance tire... which is true to an extent. 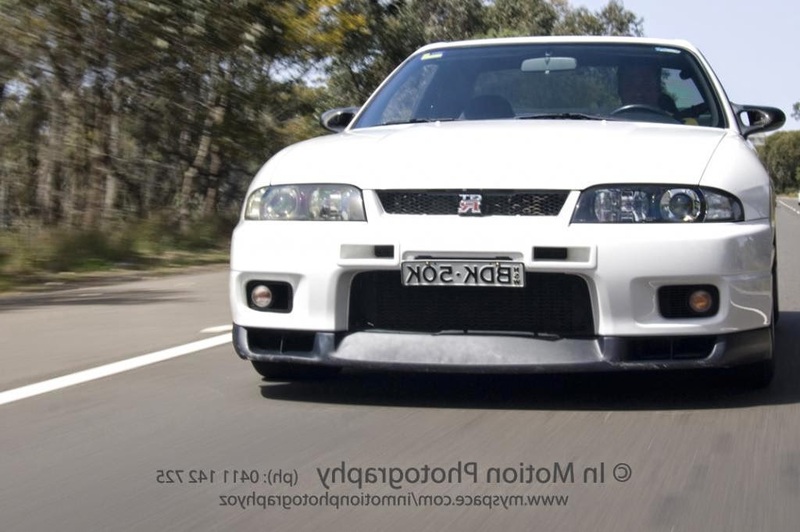 For the UK spec R33 GT-Rs, it's not surprising they were fitted with the RE010s due to their all weather characteristics. Nissan’s design division has one division that specializes only in emblems. 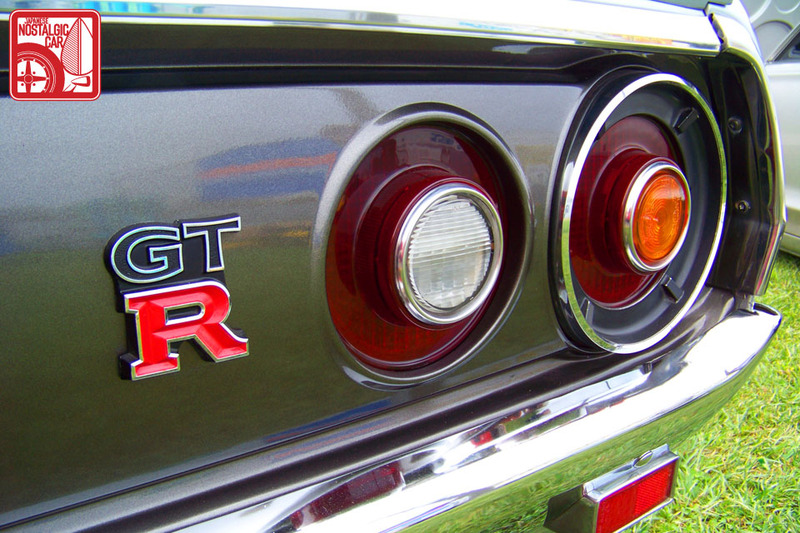 For the RB26 GT-Rs, the GT-R logo used on the Ken Mary GT-R that debuted in Jan 1973 was the inspiration. That is, “GT” on top, a larger “R” on the bottom, and the “R” letter actually being silver outlined with red being painted within the outlines, to give it more presence. It turns out that at the time of the R32, the general design trend was to minimize badging or make them smaller, in order to give a clean look to the front of the car. 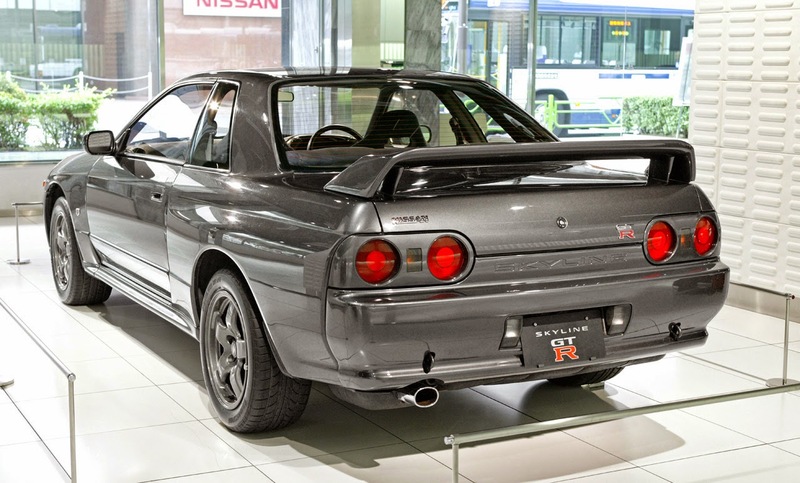 Thus, the GT-R, like all R32s, only had the “S” symbol on the front hood, and only had the GT-R badge on the trunk. However, the R33’s development chief Kozo Watanabe (who would later be in the same role for the BNR34), insisted on having a largish GT-R logo in the front as well, in order to strongly emphasize the car was a GT-R. This was in order to let cars ahead, when looking in the mirror, see that a GT-R was closing in from behind! So this is the view in the mirror as a lesser car is about to be passed. There is also a “GT-R” that is inscribed only on the left cover to the rear spoiler. Ever wonder why it’s only on one side? This was done so that a driver being PASSED by a GT-R (in the fast lane in right hand drive countries,) would see at eye level, at the moment of being passed, what car had just passed him! The logo designer was Ms. Junko Ito, who said her marching orders were to come up with an elegant and sporty design, larger than the 32 design on which it was based to reflect the larger mass of the 33, and fit it al into a square, while remaining well balanced. 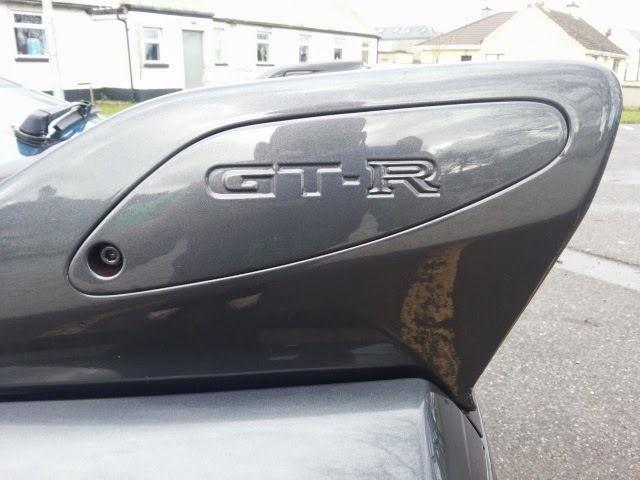 The "R" was made larger than the "GT", and there was a black background to the letters. Further the red used was more crimson than the brownish red used in the 32. Actually, this looks better - at least smaller - than the Series 1 one. 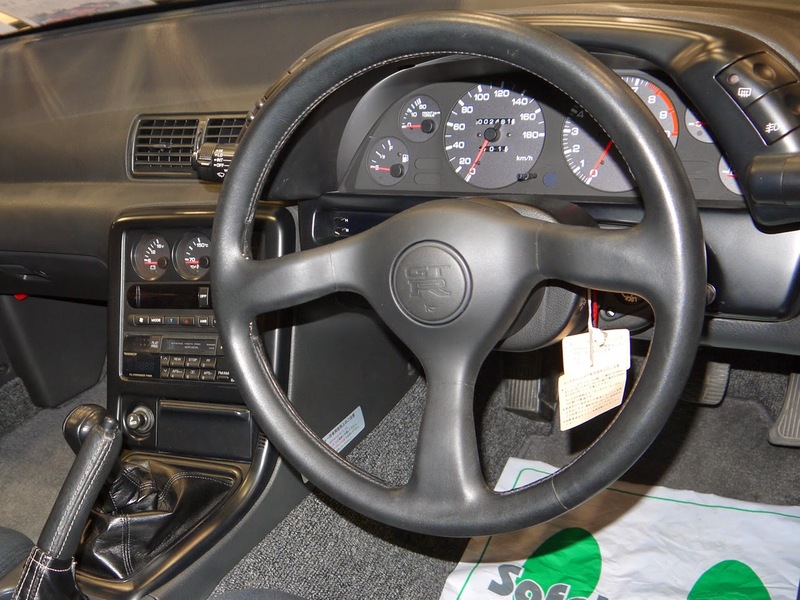 What is NOT known is that it turns out the second steering wheel (for Series 2 and 3) was actually finished as a product and ready to go by the launch of the R33, but for parts sharing purposes, the decision was made to use the older one that ended up in the Series 1. 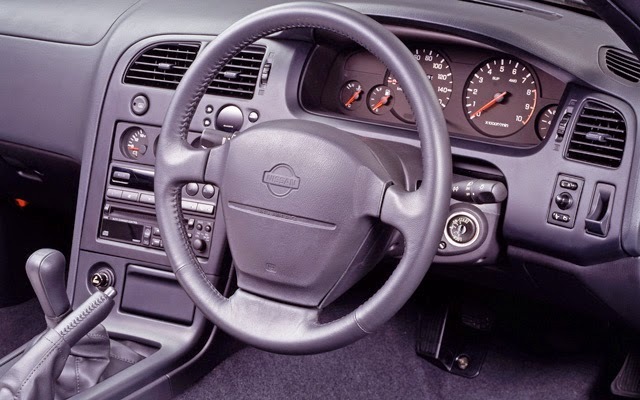 When designing the R33 GT-R, Nissan designers followed the theme of "road going racer" - so racing drivers as well as Nissan test drivers were asked for the input in designing the interior. 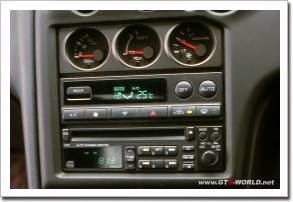 One trait as a result was the large number of gauges. The sub meters were carried over, but improved upon the ones in the R32. On the R32, the gauges were pointed at the driver, but on the R33, in addition to having larger and more readable font, the fascia was cut to allow easy visibility without having to offset the gauges. And all the gauges are all ROUND. Actually, other parts of the interior are round too, including the clock, harzard, defogger and even the HVAC switches. This was done on purpose, to create a link to the afterburner tail lamps. As one designer stated, "The beautiful circle is the Skyline philosophy." 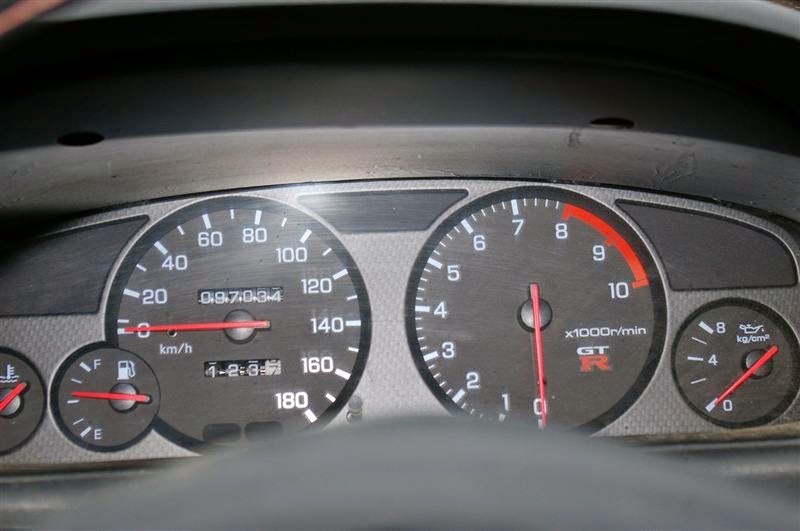 As for the main gauges, one small detail is the use of the imprinted carbon which in addition to the GT-R logo in the tachometer, was designed to separate the R33 GT-R from non GT-R variants. 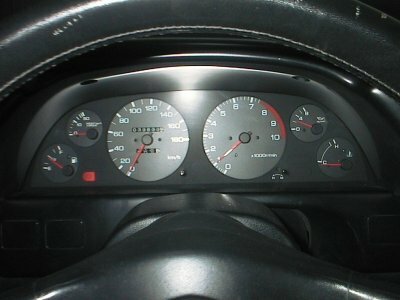 Speaking of the tachometer - unlike in the R32, where the needles of both the speedometer and the tachometer were sitting, at rest, at the 7pm position (see photo above for the steering wheel) or the non GT-R R33, where the speedometer and tachometer needles both begin in the horizontal position - Why, in the R33 GT-R why does the speedometer needle point to 9pm but the tachometer needle point straight down? I've always wondered about this. Yes, it has the carbon look, but this is a BCNR33 gauge panel installed in an ECR33. 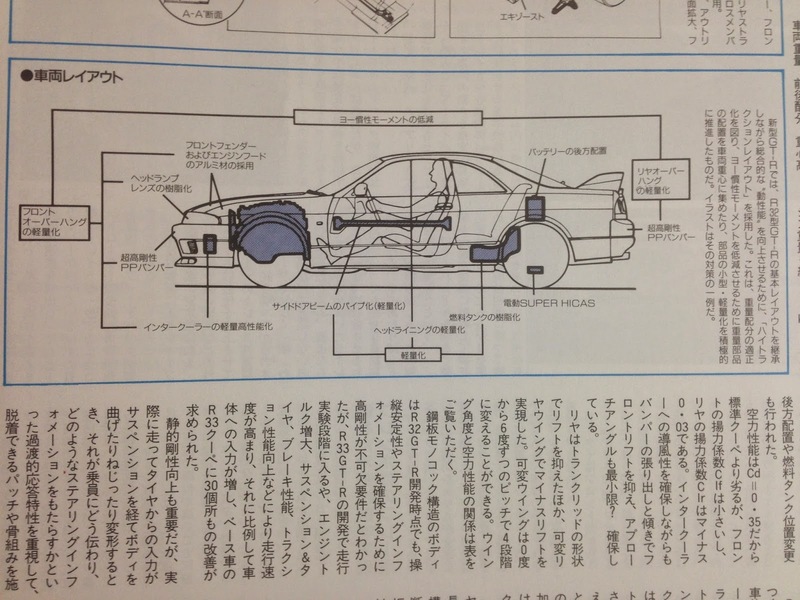 For the R33 GT-R designers, functionality was the most important aspect. But they also wanted an emotional connection with the engine as well: they wanted the driver to get excited watching the needle go up and down along with the engine revs. 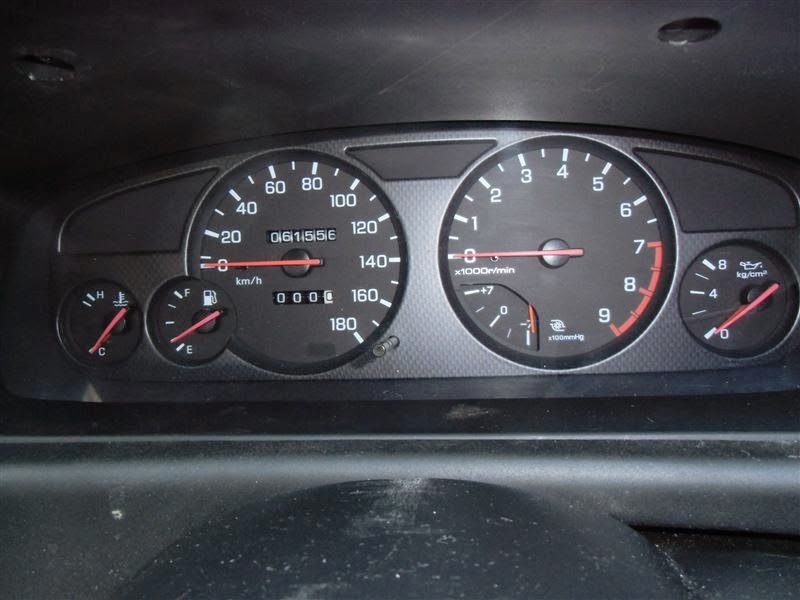 In other words, the designers wanted the tachometer to have a natural, wide angle of sweep, so the needle would rise from zero at maximum bottom below and peak near the red zone at the very top. 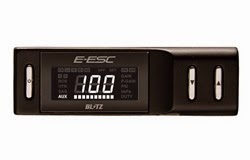 Also, more practically, when driving at high speed, by having 7000rpm at the top center, it was easy to see at a glance that you were approaching the 8000 rpm red zone. The designers also did a couple other things to emphasize the importance of the tachometer. First, they eliminated the voltage gauge found in the R32, and replaced it with a warning light, and then moved the torque meter to the 3 sub meters in the center stack area. 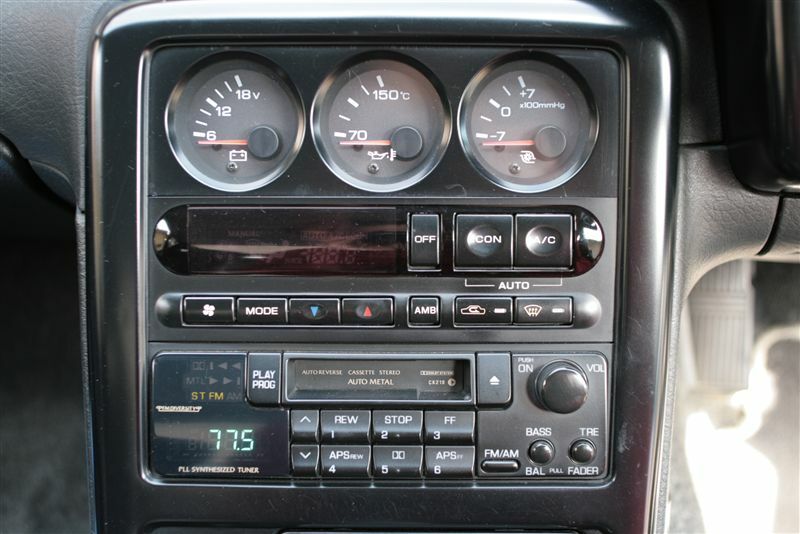 By eliminating the number of surrounding gauges from 4 to 3 (leaving only one on the tacho side), this made the tachometer appear larger and easier to see. Also - it turns out that the color of the font on the gauges is actually not white, but a light grey for better visibility. Amazing the little details they thought about, eh? Next: R33 GT-R Design Triva, Part 3: Wheels and Tires.